Temple legend holds that Vivec fought Mehrunes Dagon at the site of Maar Gan, taunting him to throw a rock at him rather than his people. It would go on to become known as the Magic Rock of Maar Gan and became a pilgrimage site. The town was founded at some point after the Planemeld. [UOL 1] During the Imperial Simulacrum in the late Third Era, the village of Markgran Forest was an active settlement, being ruled Lord Nisain. It had a rivalry with Verarchen Hall. 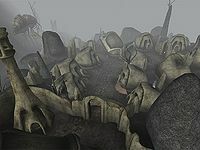 In 3E 427, the Sixth House sleeper Assi Serimilk was present in the town, and the Nerevarine visited the shrine to taunt Anhaedra and receive a blessing from the rock. Maar Gan was presumably destroyed when Red Mountain erupted during the Red Year, being located next to Foyada Bani-Dad. 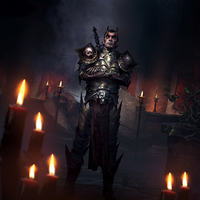 For game-specific information, see the Arena and Morrowind articles.